Description: KetoVie Café Mushroom and Spinach Frittata is a goat cheese and vegetable medley with a 4:1 ketogenic ratio with only 1.3g net carbs (total carbs minus total fiber). 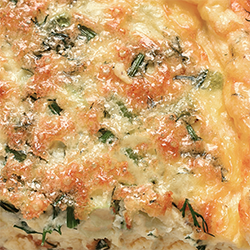 Use KetoVie Café Mushroom and Spinach Fritatta as a main dish for a delicious meal. Each tray contains four delicious servings. KetoVie is designed for individuals over one year of age and indicated for the dietary management of intractable epilepsy and other conditions managed by a ketogenic diet. Preparation: Microwave: Pull film back slightly. Microwave on medium power until thawed, then microwave for 1 minute or until desired temperature. Oven from frozen: Preheat oven to 350° F. Remove film. Bake for 10-15 minutes. Directions for use: Keep frozen until use. Storage: Use or freeze upon receipt to maximize freshness and flavor. Ingredients: Heavy whipping cream, eggs, spinach, butter (cream, natural flavoring), olive oil, portabella mushrooms, goat cheese (pasteurized goat milk, salt, cheese culture, vegetable rennet), lecithin (sunflower), vegetable blend (carrots, onion, tomato, spinach, celery, bell pepper), salt. Contains milk and eggs.